  ADV Bikes  How Good Is the New KTM 1190 Adventure R Off-Road?  Chris Birch shows how capable this bike is on slick rocks and muddy trails. Curious about how good the new KTM 1190 Adventure R really is off-road? Maybe you think it’s not as good as the KTM 990 Adventure it replaced. Well this video from Motorcycle Adventure Dirtbike TV will leave you convinced that the new KTM 1190 Adventure R is more than capable of tearing it up off-road. The MAD TV crew gave X-treme Enduro champion and RedBull Romaniacs winner Chris Birch the keys to a brand new KTM 1190 Adventure R and let him loose to see what he can do. Chris demonstrates his great skill to show the maximum off-road potential of the bike. 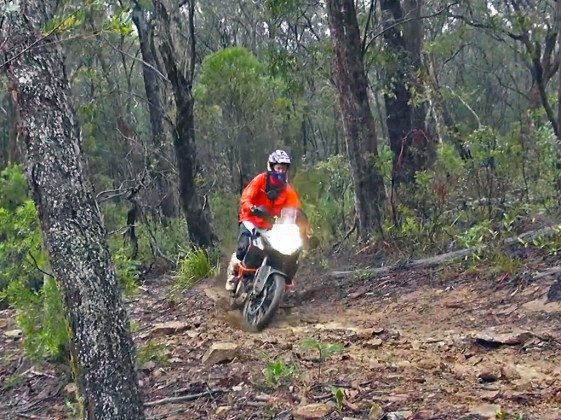 The big KTM looks impressive as Chris blasts down muddy single track trails and launches off wet rock shelfs. He is able to maneuver the big bike confidently on slick mud and we can assume, from the spinning tires, he is riding with traction control disabled. It’s really hard to believe what is possible on a 500 pound motorcycle, at least in the hands of a professional rider. Obviously, Chris Birch has a tremendous amount of skill and you probably shouldn’t try this at home, but the video does demonstrate the amazing versatility of the new KTM 1190 Adventure R. Just don’t expect to see Chris riding this bike in his next X-treme Enduro competition.